Lying at the riverside berth at Shieldhall, the bulk carrier BIG GRACE was due to have sailed this morning but weather conditions were deemed to be unsuitable - there was a fresh southerly wind at the time - and she remained alongside despite tugs being present and ready to sail the ship. 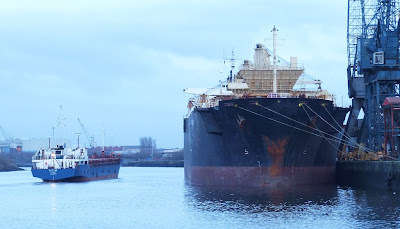 The coaster ELBETOR is making her way to the scrap berth just astern of the larger ship. Big Grace now supposed to be sailing 1200 Sunday 10th. She is a daylight only transit and that was her next window of opportunity due to Mounts Bay going to Glasgow today.